The bridge over the Merced River and Nevada Falls, below Liberty Cap. In the distance on the right, Clouds Rest. In due time I reached the top of Nevada Falls, one of my favorite spots in the Sierra. I have been to this spot dozens of times in all seasons and I never get tired of visiting. One time I came up here in winter and sat on a four-foot high pile of snow on the bridge over the river. I have been there by every route available: from Yosemite Valley, from Glacier Point, from Clouds Rest, from Tuolumne Meadows, and now, from the Ottoway-Merced Canyon route. From Yosemite Valley there are two ways to get up there: from either side of the river. 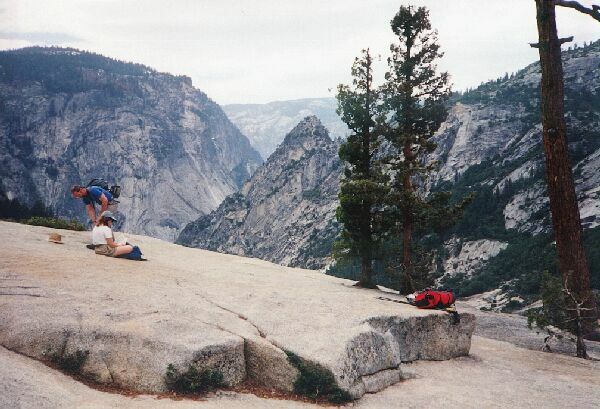 The (southern) John Muir Trail is the easiest on your body, while the northern trail is more interesting. My favorite rest-stop here. A great place to lean your pack and sit down. The point out there is Grizzly Peak, and there used to be a trail to the top: maybe it is still there in parts. 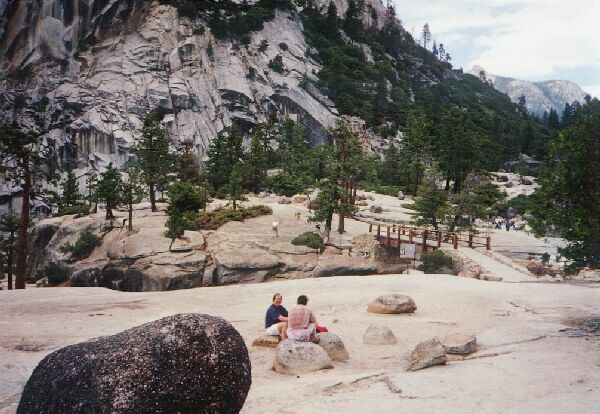 In the distince is this days destination, Glacier Point. After crossing the bridge, I dropped my pack on the slab granite where it has a nice shelf for leaning the pack against. I walked over to the brink and took in the view below.